St. Anton am Arlberg is the best Tyrolean family ski resort in Austria. Skiing at St Anton is vast, with peaks that reach 9,222′ and 4,944′ vertical served by 41 modern lifts, there’s plenty of terrain for a ski week, or a season. St Anton has excellent ski school for kids, plus great on mountain chalets and après ski for parents. St Anton village is historical and charming with great restaurants, a ski museum, and top ski hotels like the family owned and operated Bergschlossl. St Anton is the birth place of alpine skiing, a very cool place to take your kids on ski holiday. Lech Zurs, near St Anton, is another huge Austrian ski resort with loads of family-friendly terrain on both sides of the beautiful valley, eight peaks over 8,000′, extensive ski school and fine hotel lodging like Hotel der Berghof which is walking distance to Lech’s ski lifts. Oberlech is another family friendly ski village up on the slopes. 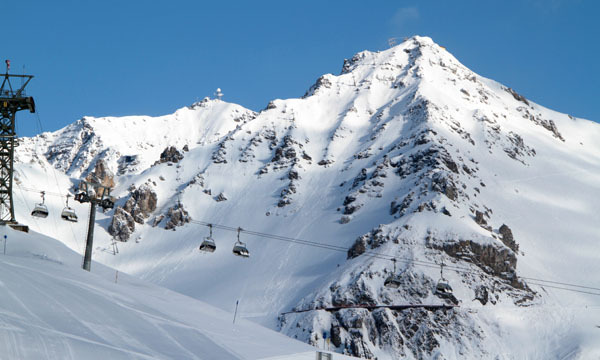 The Ski Arlberg ticket extends from St Anton to Lech Zurs and Warth Schroken for a total of 94 lifts and 340 kilometers. Switzerland’s Saas Fee is not as famous as nearby Zermatt but its highly scenic, high elevation and high on our list for family skiing. The car-free village of Saas Fee is charming, and the ski slopes are surrounded by gorgeous glaciers. Kids will love the legend of the mountain fairies and the glacier tunnel. Parents will like discovering a new Swiss ski destination that less busy and less expensive than Zermatt. Courchevel France – part of Les Trois Vallées Ski Region, is a beautiful family ski resort – and with Val Thorens and Méribel on the same ticket, all connected, you have 600 kilometers of skiing in 8 ski areas. We love Courchevel! Val Gardena in the Dolomites is historic, highly scenic, and heaven for a family ski holiday. Part of the extensive Italian Dolomites, with 1,200 kilometers of skiing in 12 regions, you can reach all this terrain from the beautiful ski village Val Gardena including beginner terrain at Sieser Alm. Staying in the charming village of Ortisei, at the grand 1810 castle, the family-friendly Hotel Adler, in Val Gardena is perfect for an Italian family ski holiday. Après ski walk the charming village or soak at the Hotel’s Water World outdoor pools and hot tubs. Vail Colorado is the first and foremost Rocky Mountain ski resorts (circa 1962). With 5,200-acres, Vail makes the top ten ski resorts list easily. Golden Peak at Vail is the family ski hub, with A Small World Play School, and Vail ski and snowboard lessons just above the center of Vail Village. Stay in the authentic Lodge at Vail, the original that opened the same year 1962 above Bridge Street in the European village. Or stay at the newer them park looking Lions Head, home to upscale lodging at the Ritz and Arrabelle. For Vail nightlife (family-style), look for the weekly free concert block parties at 6pm. On the mountain, look for Vail’s Kids Adventure Zones. Snowmass Colorado is the largest of the four Aspen ski mountains in Colorado. Skiing the Big Burn at Snowmass will make everyone in the family feel like the fire that fuels us. Snowmass is Colorado’s second largest ski resort at 3,362-acres. With ski in ski out lodging at Snowmass Village in the posh Viceroy Hotel, you will love the outdoor pool and fire pits après ski. Snowmass’ state of the art Tree House child care center offers kids learning to ski and ride. Your Aspen lift tickets also includes skiing Aspen Highlands and Ajax in downtown Aspen, plus at Aspen’s Buttermilk where the trendy Winter X-Games go off each January. Take a day or afternoon off the slopes to explore the chic ski town of Aspen during your Colorado family ski holiday. Lake Louise in Banff National Park is the biggest in Alberta, and the most beautiful of Canadian ski resorts, rivaling perhaps Whistler Blackcomb. You have 4,200-acres of ski terrain on three sides at Lake Louise Ski Resort -truly something for everyone in the family from The Front Face, The Back Bowls and Larch. Stay at the world famous Chateau Lake Louise – veritable castle on a glacial lake, or lodge at the cozier but equally upscale Post Hotel. You can also skiing at nearby Sunshine Village Ski Resort, and take a day to dog sled or tour for elk and caribou in this Canadian winter wonderland.